F.M. Burch & Associates specializes in public involvement programs, outreach services, small business development, economic development projects, construction/project management, placement of professional construction and construction-related personnel, and public relations. 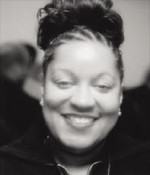 Burch works in the public, private, and nonprofit arenas, bringing her talents and skills as a savvy business leader, public policy setter, and community activist to her projects. In a Q&A with Colors of Influence, Burch explains her focus in advocating for the needs of small business owners, particularly business owners and contractors of color. How did F.M. Burch & Associates get its start? I was formerly the Governor’s Advocate for Small and Minority and Women-Owned Businesses. For several years, I was a senior policy staff member and had oversight over the office. I really got involved with the community of small businesses. I had a growing appreciation for the contributions of small businesses, and for the kinds of things they do to make their businesses work. When my term was up, at the end of Gov. Barbara Roberts’ administration, I decided to look into starting my own business. What is the core focus of your firm? Bringing together my skills and expertise in the support of small business. My current work focuses is on emerging small businesses and minority- and women-owned businesses. Some of the key industries we’re serving include the construction, transportation, design and development industries. I’m a strong supporter of all small businesses. I was a member of the Regional Prosperity Strategy Team for the Portland Business Alliance. We worked will all the chambers in the region to identify commonalities. What we came up with was a blueprint action plan for small businesses in the region. What is your mission and vision for the firm? I want to be able to provide advocacy to support small businesses to help them reach their full potential. My goal is to provide diversity services and to model good business practices. How does your background in public enable you to advocate for small businesses? I understand how state government works. I have knowledge in government processes and how to ensure input into the process. I have combined my know-how in those areas to make a difference. I was fortunate to be working for Sen. Margaret Carter in 1987 when she created the state’s Minority, Women & Emerging Small Business (MWESB) office. We were working with the Senate, the Department of Transportation, and other agencies to create a single vehicle for certification for small businesses. Before that, a lot of entities had their own certification process. It was a real burden for a small business to go to different offices and agencies to get multiple certifications. The initiative helped create a common authority than can grant certification. Certification is a good process, because it sets a bar for small businesses to strive toward. You need a business infrastructure in place, and show that you have paid taxes. You need to register your business or obtain a business license. You need to demonstrate expertise in the field you want to operate in. The process provides needed checks and balances to make sure that everyone succeeds. Faye Burch, right, looks on as NAMCO president James Posey congratulates Bill Bruce for the General Contractor of the Year Award he received from NAMCO members and leaders. Burch serves as a co-founder and vice president of NAMCO. What are some of the primary challenges for minority-owned or emerging businesses in competing for state or federal contracts? Many face union vs. non-union decisions. With state and local government, there’s a real push for labor. What can small businesses to be competitive in the marketplace? It’s different for everyone, and in every field. Relationships and networking are prime. Developing good relationships with your clients or prospects helps build confidence in you as a business person. Looking a person in the eye and letting him know who you are and what your business represents and where you’re going with your business is very important. 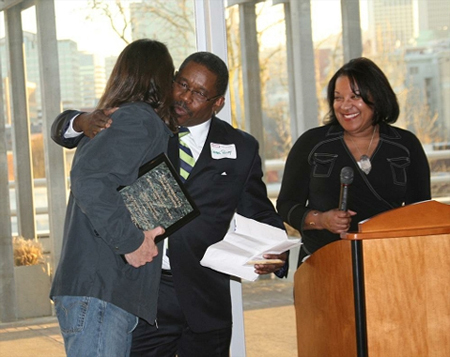 How are you involved with the National Association of Minority Contractors of Oregon? Talking with fellow contractors about three years ago, we felt that we needed a vehicle to talk about some of the issues of minority contractors in the state. Our objective was to look at the issues and to come together and talk about how they can be addressed. We’re trying to make progress in that area. Many public works projects came up, in which minorities were not participating. There were things that weren’t happening in the South Waterfront project and Portland Development Commission projects. We felt that the opportunities that should be there weren’t. We needed to come together in a way that would allow us to advocate for the needs of minority contractors. NAMCO President James Posey was a part of the previous organization. He was always interested in reviving the chapter. It took us quite a bit of work to get started. We got a sponsor and went to the national chapter to get information on what we need to do to get started. We started talking to other contractors to determine their level of interest. When we held our primary meeting, we were quite shocked at the huge turnout. How does your cultural background affect the way you conduct your business? Being a minority and a woman has been a positive. Sometimes I’ve had to prove myself a bit more. I think sometimes people hear constructive feedback from me a little better. I have a strong belief in diversity. I think it’s unfortunate when companies make excuses or find ways around the process of working with minority contractors. I believe that everybody can find opportunities to be inclusive. My work is very rewarding. I see the diverse mix that I’m able to bring to the projects that I support. It’s good to see more opportunities for minorities working in the trades. It’s rewarding to see small businesses expand and hire more people. It’s good to see that more people are able to start their own businesses. I’m glad that my work helps benefit not only small business owners, but also communities. When small businesses succeed, they invest in their communities. "I have a strong belief in diversity. I think it’s unfortunate when companies make excuses or find ways around the process of working with minority contractors. I believe that everybody can find opportunities to be inclusive." "Certification is a good process, because it sets a bar for small businesses to strive toward." "Relationships and networking are prime. Developing good relationships with your clients or prospects helps build confidence in you as a business person." "It’s good to see more opportunities for minorities working in the trades."